A combination of intensity and restraint set apart Irving Penn’s photographs. It distinguished his portraits and still lifes from the clamour of photographers craving ‘art’ and the noisy glamour at Vogue, where his career was long. A framed print or page of Penn is an oasis of calm, a rectangle for the untethered eye to wander and contemplate. Ours is an age of bloated camera trickery, in which light is all too often a means not of showing but of showing off. For the short attention span, an image need generate no more frisson than a one-night stand. Penn’s light was quite the opposite: poised and consummate, a hard-won craft of supreme diligence and slow understanding. The care of his work is there for all to see but it was never an end in itself. Above all, his photography served his subject matter. Or more precisely, it served his complex response to it. Penn observed with the greatest care and understood that the more one looks—at the surface of the world or the surface of an image—the stranger it appears. Surface beauty was his path to understanding. Still waters run deep, as they say. Penn’s ran deeper than most. 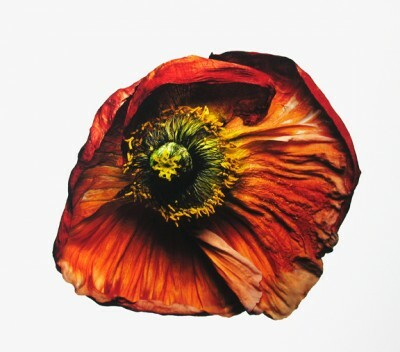 Here we have every flower photograph made by Irving Penn that was ever printed as an edition. A catalogue raisonné of sustained image-making and botanical curiosity. It forms a slice through the second half of his career. His consistency was famously unnerving. Penn came to artistic maturity relatively young and managed to sustain his exacting standards for decades. This is unusual. Much of the medium’s art history is the work of photographers who hit a ‘hot streak’ (as John Szarkowski once put it) that often lasted no more than a few years. Penn began to photograph flowers seriously in 1967. By then he had already accrued nearly thirty years’ experience behind the camera. He was ready for the challenge of extreme simplicity that flowers demand. For the next seven years he photographed a different variety for each December issue of Vogue. Thereafter he returned to the subject right up to the end. A Penn flower from the 1960s and a Penn flower from the 2000s can be almost indistinguishable. Like the still-life painters Chardin and Morandi, this was an artist who circled around his cherished motifs, finding worlds in simple forms. One of the defining qualities of the photographic medium is its glassy, unblinking stare. I think Penn intuited this. He knew that whatever the pictorial and iconographic affinities photography might have with painting, the differences between the mediums were profound. When we look at those droplets of moisture in a still life by Caravaggio or Cotán we know we are contemplating paint. But a droplet in a Penn flower photo? Where is it, exactly? What is it? The photograph has no surface to catch the eye, and so it falls through the image, and onto what? A real flower? Its ideal stand-in? It is a mirage, a fantasy of an absent object. Penn’s photographs can be so lucid, so crystalline they are almost hallucinatory. Dreamlike. This effect has partly to do with his technique but it’s also something that flowers embody for us, the complicated place they occupy in our culture and economy. The job of the flower is to attract, but biologically speaking, however much we like flowers, cultivate them, and offer them to each other as tokens, we are not the target of that attraction. Human appreciation is entirely secondary. Flowers are utterly indifferent to us. They don’t care. But we are far from indifferent to them and they play upon all our desire and caprice. The fact that we have turned flowers into symbols of so much—from joy and celebration to mourning and melancholia—should be enough to tell us they can never be reduced to the meanings a culture or a photographer may try to impose. Flowers, like photographs, have effects that overflow the language with which we battle in vain to contain them. Our physiological response to form and colour can never be entirely channeled into a psychological response (clear meaning, language, understandable emotions). There is always excess, an energy that won’t be harnessed or put to work. However tended and cultivated a flower might be, it remains wild. On my desk as I write sits a copy of the first issue of Portfolio, the magazine intended by its art director Alexey Brodovitch to be the most beautiful ever made. [i] This was 1949. A ten-page showcase of Irving Penn’s pictures more than meets that promise. It opens with ‘Optician’s Shop Window’, a photograph made ten years earlier [Fig. 1]. It is a found still life of artificial eyeballs encountered while the 22-year-old Penn was out walking the streets. Stark and uncanny, unseeing eyes were common enough motifs among photographers expressing their affinity with surrealism. In general, Penn’s iconography had little in common with that particular movement, but he did understand that his chosen medium never really escapes the surreal. As Susan Sontag noted much later, photography is essentially surrealist because it supplants one version of reality with another. [ii] It promises access to the real but defers and displaces it. It is an infernal trick. Penn explored this quality in the most unlikely way: through perfection. It was from de Chirico’s metaphysical paintings that I learned how intrinsic to its character is an object’s situation. It was from him, too, that I knew how the tensions produced by any displacement of that object could be productively used in making a picture. More often than not, the ‘situation’ into which Penn plunged his flowers was a void, far removed from their natural habitats. The flawless whiteness that surrounds these specimens is the space of pure studio, pure page, pure photographic print, and pure vision. Each flower was entirely individual, and when two or more appeared in the same photograph they only served to heighten one another’s particulars. Penn was not looking for examples that were representative of their species, nor compiling a botanical guidebook or taxonomy. Each photograph is a unique encounter with a unique thing in all its unsettling wonder. At times the flowers appear prim and demure, their petals displaying themselves while covering their inner organs. But as Anthony West reminds us, where there is a flower there is sexual reproduction. And so Penn must to go beyond that coy fan dance, beyond the veil. Some of his strongest pictures confront the inner workings of the flower. Beyond the surface beauty lies an other-worldly fascination, where ugliness and allure will not be separated. At times Penn ‘de-flowers’ his specimens. He does so in that endearingly attentive and engrossed way a child will come to know a flower by destroying it systematically. She loves me. She loves me not. By the end the flower is in pieces. Penn’s photographs of floral destruction have this ritual quality, and one can tell he is just as fascinated by the messy remains as anything pristine. Look at Iceland Poppy (Papaver nudicaule) from 2006, made just three years before his death at the age of ninety-two. The singular bits and pieces are arranged in an orderly grid, but there’s no escaping the feeling that grids have no place in nature. We may grow flowers in neat lines or place their decaying forms in decorous array, but flowers are flowers. Moreover, their demise is advertized even by their glorious bloom. They do not last and neither shall we, unless we reproduce. That’s not unlike photography. [i]. ‘Irving Penn. 9 Photographs’, Portfolio 1, no. 1, 1950. Unpag. [ii] Susan Sontag, On Photography, Penguin, New York, 1977, pp. 51-52. [iii]. Georges Bataille, ‘The Language of Flowers’,first published in Documents 3, June 1929, reprinted in Visions of Excess: Selected Writings, 1927-1939, trans. Allan Stoekl with Carl R. Lovitt and Donald M. Leslie, Jr., University of Minnesota, 1985), pp.10-14.